Low-Carb Melon and Raspberry Salad with Vanilla Coconut Sauce (Vegan) | Low-Carb, So Simple! -- gluten-free, sugar-free recipes with 5 ingredients or less | Low-Carb, So Simple! It’s hard to believe that something this delicious is so simple, and vegan! I usually use tons of organic dairy products, especially heavy cream, but lately I’ve been into coconut milk because of its smooth and naturally sweet flavor. This succulent dessert — or breakfast — is topped with delicious coconut milk sauce with a hint of vanilla. The sauce consists of a mere two ingredients! Even better, this simple fruit salad is surprisingly low in carbs. Mix the coconut milk and stevia in a small bowl. Start with a small amount of stevia and add more if needed. Slice or cube the melon. 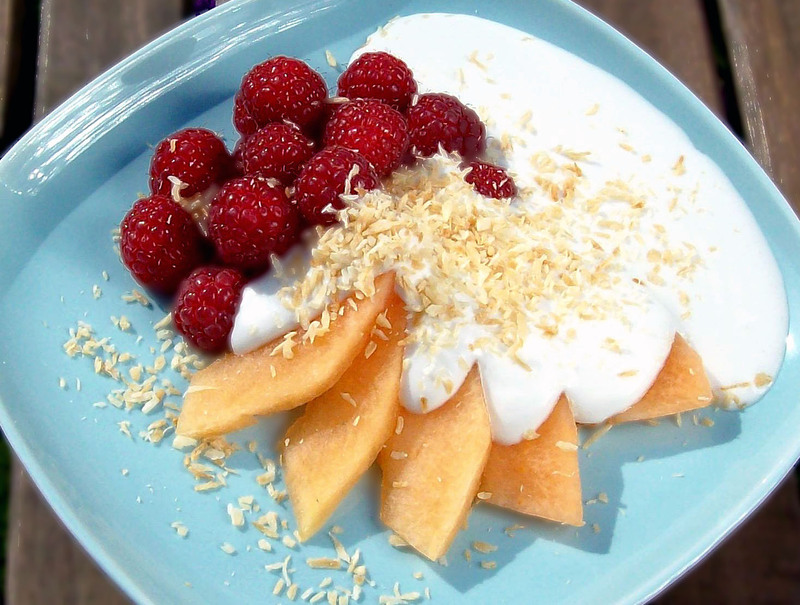 Arrange the raspberries and melon on plates or place them on dessert bowls. Pour the coconut milk sauce over each serving. Sprinkle the shredded coconut on top of each serving and serve immediately. I recommend toasted shredded coconut rather than raw. 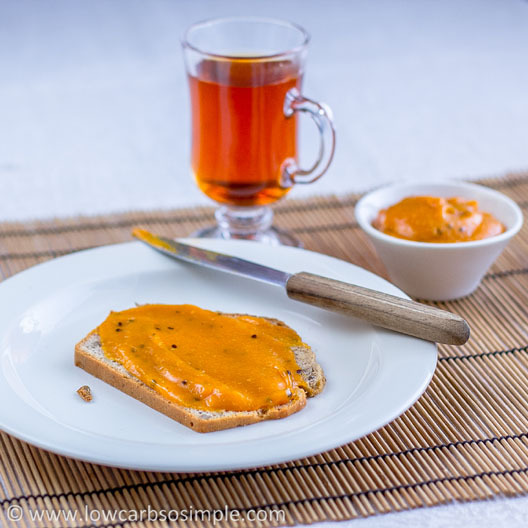 Toasting makes the flavor nuttier and the texture crispier. If you don’t have toasted, shredded coconut at hand, here are short instructions how to toast shredded coconut. It’s really simple: Heat a skillet over a medium heat. Add the shredded coconut and stir frequently until the coconut has got some golden brown color. Be careful, coconut burns easily. I always keep toasted shredded coconut in a glass jar in the fridge. It’s easy to just grab some coconut and sprinkle on desserts, use when baking and wherever you want to have some crispy, nutty coconut. I wanted to develop a low-carb fruit salad. Now is the season, and fruits and summer just go together. But, as you know, fruits are not really low in carbs. At least not most of them. So, I listed fruits which have the lowest amount of carbs. Avocados, melons, grapefruits, … But why to limit to just fruits? Most berries are also low in carbs, and they are healthy as well. Not too much bad fructose. Raspberries and cranberries are the lowest in carbs, to my knowledge. It’s also peak season for raspberries, so I decided to use raspberries. Anyway cranberries are often associated with the holidays, so raspberries are somehow more summery. Just chopped fruits would have been a bit boring choice. Well, a delicious one, but without a catch. I wanted to have sauce. I tested different fruit combinations and sauce experiments with pureed avocado, grapefruit juice, lemon juice, different flavors of stevia and coconut milk. My original thought was to have melon and avocado slices with vanilla coconut sauce with shredded coconut sprinkled on top. This, however, tasted quite bland. Really bland, so to say. The combination needed something tangy. Adding lemon or grapefruit juice didn’t somehow bring the result I was hoping for. 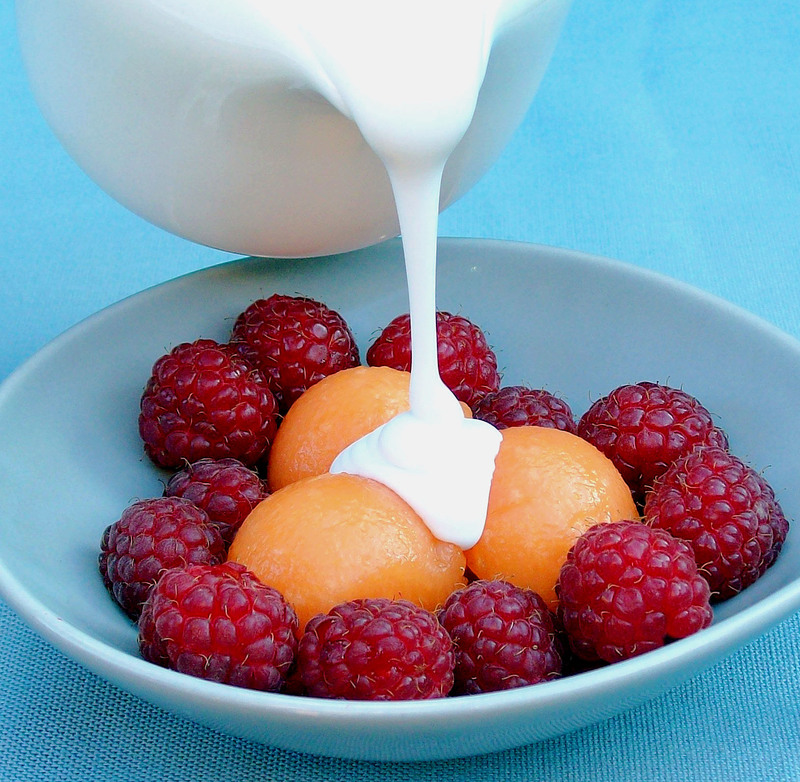 Next I tried melon and raspberries with sauce made from coconut milk and vanilla stevia. Yummy! I added toasted, shredded coconut and the combination was perfect! Nevertheless, I wanted to continue experimenting. I tried grapefruit and avocado slices with the same vanilla coconut sauce. Well, certainly edible and actually quite okay, but I liked much more the previous experiment with melon and raspberries, so that was it. If you like thicker sauce, chill the can of coconut milk in the fridge overnight, and serve the sauce chilled. At least this brand what I’ve used here tends to get thick throughout when chilled. Some other brands of coconut milk tend to separate while storing and chilling: the thick coconut cream floats on the top of the liquid coconut water. After carefully opening the can, just scoop out the thick, solid coconut cream. Add liquid coconut water from the bottom of the can until you get the consistency you like. Be sure not to shake the can before opening. 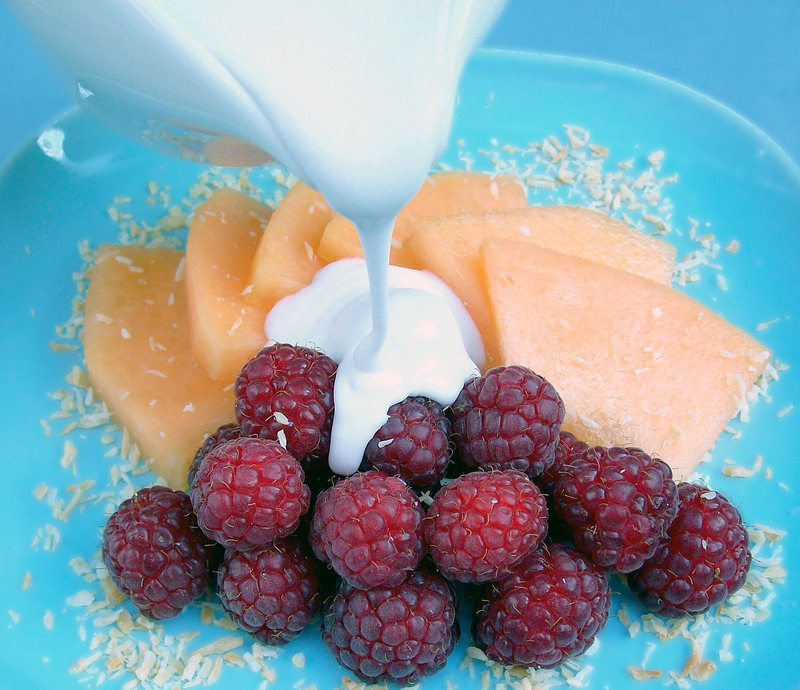 Whatever brand of coconut milk you use, I recommend to use full-fat version, not light or reduced-fat. Chopped almonds or nuts like macadamias, pecans or walnuts. Toasted or raw. 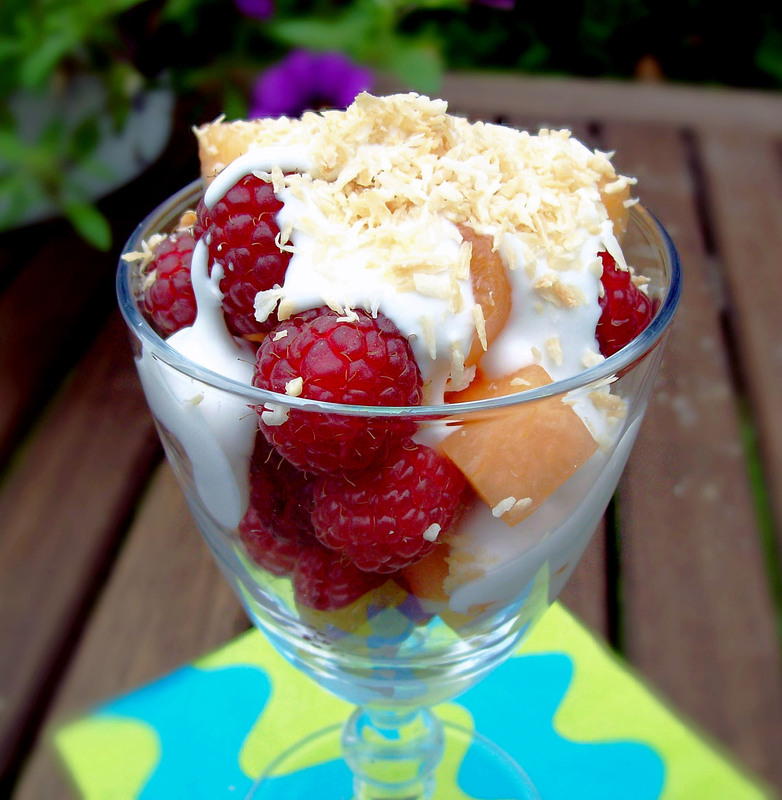 If you fancy even more refreshing or cooling dessert, just combine everything (melon, raspberries, coconut milk, vanilla stevia and shredded coconut) with 2 cups (480 ml) of crushed ice in a blender and blend until smooth. Serve as a perfect smoothie on a hot summer day or whenever you need a pick-me-up drink. You can omit the shredded coconut for a smoother result. Tara, thank you! I’m so delighted to hear that you and your family like the recipes! The coconut milk I use is the canned type. The creamier the better 🙂 I use Unsweetened Organic Coconut Milk (Classic, not Light) from Native Forest (link in the recipe ingredients). To my knowledge it’s the only organic coconut milk with BPA-free can, though there is some controversial information on this.